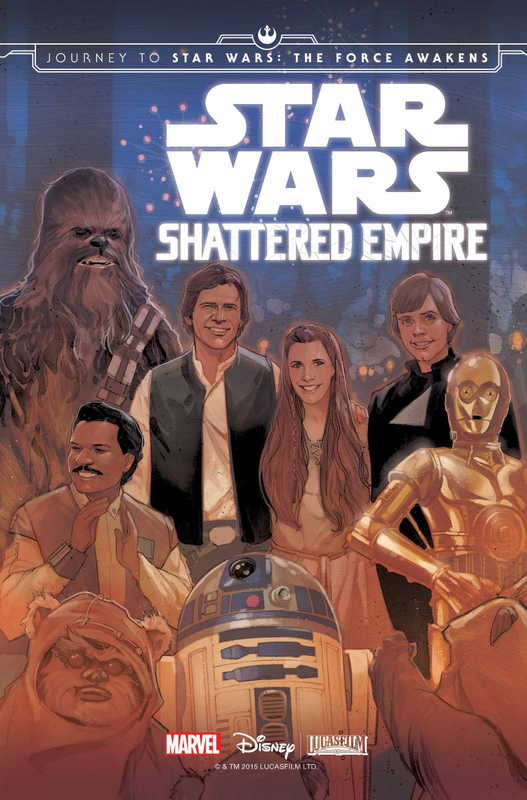 Shattered Empire gives us very few clues: not that we necessarily expected or wanted it to. Star Wars — the new totally canon Marvel comic — felt (at least to start with) like a movie. I have described reading it as being like looking outside the frame; seeing what was going on just before or just after or just out of shot in a famous scene. Shattered Empire feels more like an annotation; like someone scribbling in the margins of a holy text. [*] Quite pretty scribbling, actually. But it keeps telling me things I wish I didn’t know. As Luke Skywalker flies the shuttle -- the shuttle bearing his father’s body -- from the Death Star to Endor, he is intercepted by an A-Wing pilot. I was kinda in a hurry? This is the Luke Skywalker who has just acted out the world-saving drama that is at the heart of the whole ennealogy. The Luke Skeywalker who has taken off the black mask and seen his father’s face for the first time. The Luke Skywalker who has, incidentally, been zapped practically to death by the Emperor. His last words in the Trilogy are “I’m going to save you”. They should be left to stand; until after the funeral pyre, until after the Force ghosts. If we must slip in behind the frame, then the question we would like an answer to is "What came of Anakin-Vader’s last command?" Did Luke tell his sister he was right him? And if so, how did she react? Can she forgive the person who blew up her planet as easily as Luke could forgive the person who killed Owen and Beru and Ben and Biggs? And how does this knowledge affect her? Leia appears in the comic, but there is no sense that anything traumatic has happened. Han seems to have forgotten all about the “he’s my brother” revelation within literally minutes. That’s a scene we’d like to have seen as well. Of course, we know what’s going on. Jason Aaron is in some respect strait jacketed in the Star Wars comic because he is writing about character’s in the past tense. He can’t decide that Chewie was killed in between episode IV and V; any major new character introduced has pretty much got to be vaporized before they get to Hoth. But he’s also got a certain amount of leeway: he knows where his cast have got to end up, but he is pretty free to choose the route. And he knows lots of stuff that they don't. Greg Rucka has all the limitations but none of the freedom. He can’t do anything that might contradict the Force Awakens; but he doesn’t know, any more than we do, what the Force Awakens is actually going to be about. There is a plot. The plot is that The Empire wasn’t completely defeated after Return of the Jedi. Before the last firework burns out and the last gub-gub fades away, the Rebels are defending themselves against Imperial Remnants who are bent on carrying out the Emperor’s last command — which involves flattening particular planets like Sterdic IV, the Wretch of Tayron and Naboo. Repeating the Rebel Propaganda that the Emperor is dead is treason, obviously. I suppose that if there is going to be a story, there have to be baddies, and I am pleased that the new film will involve the real space ships from the real movies not the made up hardware from the prequels. But does this have to be done in such a way as to wipe out Return of the Jedi? 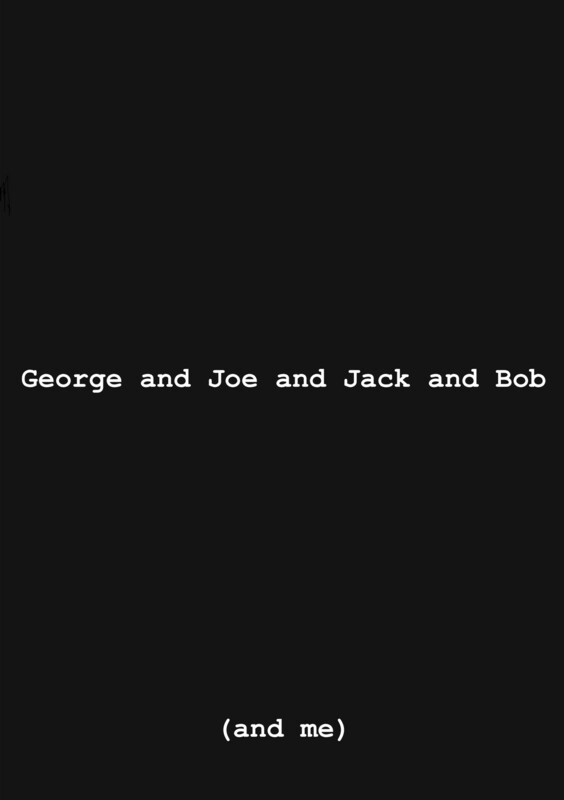 The film ends on a Great Victory. There are fireworks. George retrospectively decided that there were fireworks on Naboo and Coruscrant and Tatooine. But here is Han on the morning after telling us that "it’s not over yet” and wondering why no-one told the Empire that it lost. One of the “crawls” actually goes so far as to say that "for many rebels, the dream of laying down their arms and living in peace seems further away than the elation of victory promise". If the Empire is a military machine then killing off the Leader might in itself make very little difference. The loss of a huge piece of military hardware that they’ve sunk vast resources into would probably be more serious. To lose one Death Star might be regarded as misfortune; to lose two seems like carelessness. But if the Empire is the metaphorical representation of all that is Evil then killing the Dark Lord ought to be pretty final. Tolkien knew what he was doing when he said that the Dark Tower literally fell as soon as the Ring went into the furnace. In Lucas’s original conception, the Emperor was basically weak and corrupt: out of touch with his people, manipulated by his generals, somewhere between President Nixon and the emperor of Japan. But in the canonical version, the transition from republic to Empire and the Clone Wars are part of a Sith Masterplan. With the Sith Master dead and the Sith Apprentice both dead and returned to the Light Side, surely the Empire ought to revert to a more or less benevolent Republic more or less immediately? Indeed, if the Emperor knew he was about to lose, wouldn’t preserving the Sith bloodline be his primary concern? Leia goes to Naboo to warn them about that the Empire is coming. Palpatine demilitarized the planet, but Queen Soruna knows that there are ships and weapons from the Olden Days hidden deep in the the bowels of the planet. (Naboo fashion hasn't become any less ridiculous in the 30 years since we were last there, incidentally.) 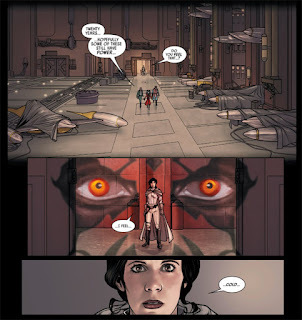 Down in the hangar, Leia announces that it is cold; and we see Darth Maul’s face superimposed over hers. Is this a clue that Maul is alive and well and appearing in Episode VII? He was killed in Phantom Menace, of course, but recovered from his death during the Clone Wars TV series and not definitively killed off. He'd have to be well into his 80s, but we don’t know what the expect lifespan of a red and black faced Sith would be. (It was cannon that Wookies live 200 years before The Force Awakens was a twinkle in Walt Disney’s eye.) I think it’s more likely that Leia just experiences a Force shiver because she’s in the place where Darth Vader’s predecessor met one of his deaths. I sometimes wondered if writer Rucka and artist Checchetto have grasped the iconic significance of the material they're dealing with. Leia and the gang fly the pointy yellow Naboo ships from Phantom Menace against a post-Imperial Star Destroyer and it launches its entire cohort of TIE fighters at them. Lando and the little mousy guy from Return of the Jedi arrive ("why show up early when you can arrive in the nick of time") with some X and Y-Wings to save the day. It ought to feel at least a little bit special to see Prequel Ships and Trilogy ships fighting against and alongside each other. At any rate the artwork ought to rise to the occasion. But it doesn't. Something in the way it's drawn makes me feel that no-one quite spotted what an important moment this should have been. Where is full page spread of a Naboo Figheter and an X-Wing alongside each other? Luke Skywalker suddenly becomes very worried about retrieving something which the Empire stole from the Jedi Temple on Coruscrant. He hasn't had a chance to change his clothes since the movie, so his black robe and black jumpsuit still scream "potential dark lord" at us. He's not become Yoda yet, but he is inclined to be cryptic in a way that I imagine makes people want to punch him. ("I send Artoo to find a pilot, and here you are. Interesting.") It turns out that what he is after is a tree — a tree which grew in the Jedi Temple. The Force is with it, apparently. And it is sufficiently important that the Empire have kept it heavily guarded. This is such an off the wall idea that the one thing I think we can be totally sure about is that the Jedi Tree will be an important part of The Force Awakens. Everything is told from the point of view of one Shara Bey and Kes Dameron, a pilot and a seargent in the Rebellion. Shara acts as Leia’s wingperson during the trip to Naboo and helps Luke retrieve the Jedi tree. The story ends with them “mustering out” of the rebellion and retiring to a foresty planet with ziggurats in the background. Although we never see him, they have a child named Poe. Luke gives them the tree to take care of. Of course, there may be dozens of hidden foreshadowings running through the comic which will only become apparent in December. But it looks very much as if we have a four part series to set up the fact that X-Wing Pilot Poe Dameron grew up on the planet Yavin with his aging parents, who were veterans of the Battle of Endor and custodians of the White Tree of Numenor. For me, that’s one of the nicest things about these comics: they gently fold the hated Prequels back into the sacred Trilogy. Seeing Leia go to Naboo and hearing Luke speak of the Jedi Temple is almost like the thawing out a family feud. But people who regard Jar Jar Binks as a personal affront, and will reject these books on the grounds of Queen Soruna alone. And I am guessing that "should Abrams admit that the prequels ever happened" will be the biggest dividing line over the Force Awakens. [*]You can tell how pious a Christian is by how many Bibles he has worn out with cross- references and marker pens. A Muslim would find the merest pencil underlying of a helpful passage blasphemous. [**] Walt Simonson said the only clues he had about the original trilogy he had when working on the old Marvel comics were when a plot was specifically vetoed. 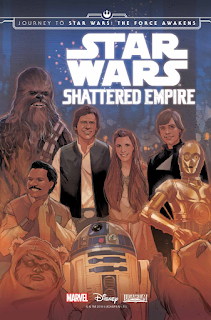 He had an idea to do a comic in which the Empire created a second Death Star ("and this time put some chicken wire over the exhaust port"), but George Lucas said he couldn't. "Aha..." he said. If everyone reading this essay pledged $2, I could do this full time.